Interested in learning new skills and techniques? We offer a variety of classes for fiber enthusiasts. New classes are added regularly so please check back and/or contact us to join our email list to get direct information. Please note that all classes, except beginning classes, require students to have a basic understanding of either knitting or crochet. Creative Joins & Contemporary Embroidery for Clothing with Anita Luvera Mayer. This one day workshop focuses on learning creative methods for joining clothing seams including the decorative faggoting and the knotted buttonhole. The contemporary embroidery will include raised chain band, Kantha stitching, and French knots. A wide range of samples will be completed. Required materials include a 2” – 3-ring (or wider notebook), scissors, paper and pen for taking notes, and lunch. This is a 1-session class and will meet Saturday, April 27th from 9am-4pm. Class and materials fee is $90. Oops II with Anne Barry. Anne, fondly known as our knitting encyclopedia, will be offering Oops II again this spring. This class is designed for advanced-beginner and intermediate knitters, and will include such topics as learning to ‘read’ your knitting; how to find your place in a pattern; tricks for joining in the round without twisting or gapping; matching cast-ons and bind-offs. As a bonus, Anne will discuss stretching techniques to keep you lose while knitting. Please come armed with your current project and your questions! This is a 1-session class and will meet Saturday, May 4th, 1-3:30pm. Class fee is $35. The Art of Blocking with Fran Jepperson (& possibly guests!). We often field questions about the ins and outs of blocking. Is it really necessary? Should we be using blocking wires or pins? Do we really need to invest in blocking mats? What are the differences between blocking sweaters and blocking lace? We’re here to answer these questions! This is a 1-session class and will meet Saturday, May 4th, 10:30am-12:30pm. The only required materials are your curiosity and questions (and any projects you may want to bring to class to discuss blocking). Class fee is $25. 2019 LYSTour Pattern (shh, it’s still a secret!) with Emily McNeil. You toured the Sound during Tour, you fell in love with the pattern and the yarn, and now you’re ready to cast on but could use a little support. This is the class for you! This is a 1-session class and will meet Thursday, May 23rd, 5:30pm-7:30pm. Class fee is $25. 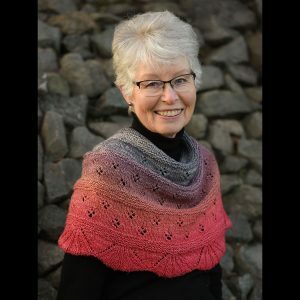 Shoreline Cowl with Fran Jepperson. Our Shoreline Cowl can be worn a variety of ways for a variety of occasions. Make it in our Rustic Silk for an elegant warmer-weather accessory or in our Radiant DK for a cozier feel. In this class you will learn several different cast-ones, how to incorporate beads into your work, how to put in a lifeline, and more. Required materials are one Radiant DK or Rustic Silk, 24” US6 or 7 to get gauge, and about 55 4mm beads and beading hook if desired. This is a 1-session class and will meet Saturday, July 27th, 10:30am-12:30pm. Class fee is $25. Cowl of the Month #1: Independence Cowl with Fran Jepperson. Just in time for 4th of July, this cowl is a fun head turner. It begins with just a few stitches and builds to a chevron-shaped cowl. You will learn the garter-stitch-tab beginning, how to place a few beads, and an i-cord bind off on a project that you can easily finish in a week or two. Materials are 3 skeins of Fidalgo Artisan Yarn One Foot Two Foot in red, natural and blue (of course! ), 24″ US5 or 6 needle (depending on how tightly you knit), and approximately 55 white beads, size 3 or 6.This is a 1-session class and will meet Saturday, June 15th, 10:30am-12:30pm. Class fee is $25. Private and Group Lessons. Are you looking to learn a particular technique or perhaps could use a one-on-one beginner or refresher session or two? Or maybe you have a couple friends with whom you’d like to set up a project class? Let us know what you’d like help with, and we’re happy to schedule instruction tailored specifically to you! Need some assistance? Please join us at our yarn clinic, most Saturdays, 1pm-3pm with Carol Harrington.